APRIL is WOMAN WARRIOR MONTH featuring martial arts films with a female lead! Every Sunday at 8pm! 4/7: COME DRINK WITH ME (1966) starring Cheng Pei-pei. 4/14: DANCE OF DEATH aka ETERNAL CONFLICT (1976) starring Angela Mao. 4/21: WING CHUN (1994) starring Michelle Yeoh. 4/28: CHOCOLATE (2008) starring JeeJa Yanin. 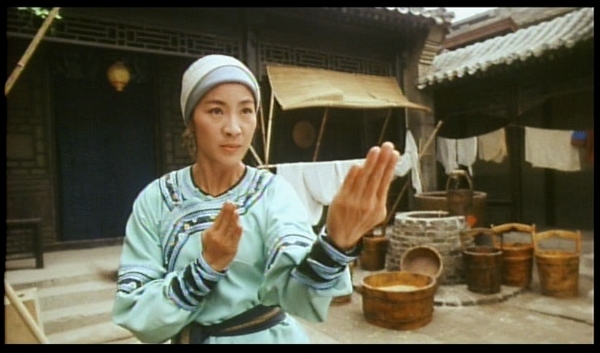 The Wasp & Orchid film series is extremely excited to present one of our favorite action heroines Michelle Yeoh, starring in a film that is definitely in our top ten, all time favorite martial arts movies: Yuen Wo Ping’s Wing Chun. Born in Malaysia, Michelle Yeoh began training in ballet at four years old. After a spinal injury prevented her from pursuing ballet at the Royal Academy of Dance in London she went on to win the Miss Malaysia beauty pagaent in 1983 at the age of 21. Participating in several action films during throughout the 80’s she eventually took a hiatus from acting but had a huge comeback in 1992 opposite Jackie Chan in Stanley Tong’s Supercop. Like Jackie Chan she has become famous for performing her own stunts, sustaining several injuries over her career (check out Michelle jumping a motorbike onto a moving train here). She first became more widely recognized to American audiences as a Bond girl in the movie Tomorrow Never Dies (1997) and earned international acclaim for her role as Yu Shu Lien in Ang Lee’s Crouching Tiger, Hidden Dragon. Directed by world-renowned martial arts choreographer Yuen Wo Ping, Wing Chun also features action superstar Donnie Yen as well as the actress Cheng Pei Pei (whose film Come Drink With Me kicked off this female fighter series). The movie features plenty of Yuen Wo Ping’s gravity-defying acrobatics and characteristic slapstick combat. Wing Chun is a genre classic not to be missed! Watch the overly dramatic english language trailer here. A thoroughly detailed bio of Michelle Yeoh with tons of pics can be found here. An astonishing list of incredible films involving Yuen Wo Ping here. The Wasp & Orchid Martial Arts Choreography Film Series explores martial arts choreography in its most innovative and inspirational forms. Each screening highlights a particular martial arts style, action coordinator, or individual actor and actress, featuring cinema from China, Japan, Korea, Southeast Asia and beyond.